There is perhaps no greater story in modern soul music of the power of redemption and faith than that of Kem. Through his tribulations and ultimate success, he has become an inspiration to many and a role model to a generation of young, independent artists. Born in Nashville and raised in a middle-class Detroit suburb, Kem's life took an unfortunate turn after high school. Instead of advancing toward his dreams of musical success, he succumbed to a difficult combination of self-doubt, homelessness and addiction that lasted for nearly a half decade. He ultimately found rehabilitation through faith and music, and began again a long trek toward a goal of establishing a successful career as a singer -- and helping resurrect Soul Music on urban radio in the process. During the 90s, Kem became a local fixture around Detroit, singing his jazz-infused music just about anywhere that would have him. He originally decided to record a live album of a number of songs he had written and played for audiences for some time, but instead in 2002 moved into the studio to create his debut album, Kemistry. Starting with a goal of selling 10,000 copies -- a lofty goal for an independent artist -- Kem tirelessly promoted the album at concerts, Mom and Pop record stores and even beauty salons. He reached his goal within a half year of the CD's release and also hit the radar of former Detroit label Motown, which signed him to a multi-album contract and released Kemistry to an international audience. Unlike many independent artists who view the signing by a major label as entry into the promised land -- only to be disappointed by internal company politics and stretched promotional resources -- Kem kept control of his career and, with his own promotional team, continued to promote Kemistry as if it were still an independent album, creatively introducing the album in new ways and in unique places where a major label simply wouldn't go. And while many urban artists over the past 40 years have searched for success through compromise in their music, Kem's approach was notable in large part because he approached the process of success not through pandering and dumbing down his art but rather through finding creative ways to introduce music -- his music -- to audiences that would appreciate it. His strategy worked. With a mellow groove that straddled the line between classic soul and jazz, all fronted by Kem's interesting phrasing and Al Jarreau-like voice, Kemistry gained momentum throughout 2003 and found a home with adult audiences longing for a respite from hip-hop infested radio and often unimaginative smooth jazz. The disc amazingly went Gold and the first single, "Love Calls," became a staple on Urban Adult Contemporary and Smooth Jazz stations for over a year. 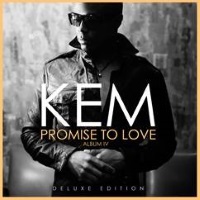 In May, 2005, Kem released his much anticipated follow-up, Album II, which, like's its predecessor, became a fixture on quiet storm radio. Arranged mostly with electric piano and a drumbeat and fronted by Kem's smooth, sometimes whispery voice, Album II immediately fit like a comfortable old sweater. The disc rarely strayed from its mellow nighttime beat, picking it up on "True Love" and the Al Jarreau-like "Into You," but spending the most time on tasteful downbeat numbers like the excellent "Find Your Way (Back In My Life)," "I'm In Love" and the album's first single, "I Can't Stop Loving You." The disc also showed Kem continuing to develop as a lyricist, earnestly weaving his way through themes of romantic love and faith. It was another fine mood piece that cemented Kem's place as one of the most unique, appealing soulful singers today. After a five year absence with many hints of new music coming out, Kem finally returned with Intimacy, his third album, on August 17, 2010. Led by the single "Why Would You Stay," it became one of the most highly anticipated albums of the year. It won for him the Major Label Album of the Year at the 2010 SoulTracks Readers' Choice Awards. In early 2011, Kem announced a tour with El DeBarge and Ledisi.